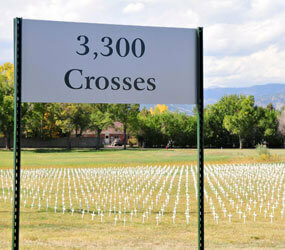 BOULDER, Colo. – A pro-life project to build and display 3,300 crosses in memory of the number of babies aborted daily drew more than 80 willing participants at Sacred Heart of Mary Church in Boulder. “It was sometimes overwhelming to me, as fairly simple as are they are to assemble, that I couldn’t do it as fast as abortions were happening,” he said. Wolfe worked with John Spritzer, also a parishioner, who built 4,000 of the 12-inch crosses at his home during Lent; he constructed 100 crosses a day for 40 days. This was the first year the parish organized the pro-life project that received support from the church’s pastor, Father Marcus Mallick, and the Pastoral Council. The Respect Life Committee decided to place the crosses in the vacant church property across the street. Suzie LaVelle, who also co-chairs the committee, said it is the perfect spot to display a pro-life message. Along the road beside the white crosses is a sequence of six signs that can be read by motorists driving westbound or eastbound. The signs state the facts of abortion and the national hotline for Rachel’s Vineyard, a support group for women after abortions. LaVelle said the statistics about abortion were taken from the Guttmacher Institute, a research and policy analyst of sexuality and reproduction issues and an affiliate of the Planned Parenthood Federation of America. 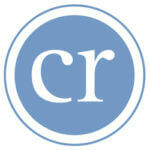 The signs were to stay up throughout October, observed as Respect Life Month. Ultimately, those involved want the signs to give others hope and encouragement to seek support after abortions, LaVelle said. Although they may not see the impact of the field of crosses, Wolfe said he hopes it will touch someone’s heart.